It has taken many years of dedicated work by professional organisations, local authorities, the Environment Agency and hard-working volunteers to return the Dour to being a healthy river. Small river ecosystems are very sensitive to pollution and the Dour needs ongoing attention to keep it in good condition. 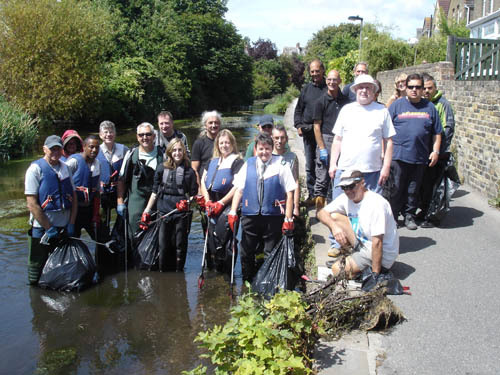 Regular volunteer working parties help by removing fly-tipped waste and rubbish that finds its way into the water and onto the river banks. Contact White Cliffs Countryside Project for information on "river clean" days. Volunteers clean the Dour in summer. In the winter the river bed is not disturbed to allow fish to breed. You can also help keep the river health by reporting any fly-tipping of rubbish you see so it can be removed as soon as possible. Dog mess on the riverside paths is a continuing problem. Dog owners must pick up their dog's mess and place it in one of the many bins provided. If you notice a problem with frequent dog fouling please contact Dover District Council so the dog warden can increase patrols in the area affected.